Outside Bratislava’s old Market Hall, the pale yellow cobblestones glow in the searing heat. Inside, it is minds that are overheated and aglow, as dozens of programmers hack into their notebooks, trying to find a way to bring us all outrageously fast – albeit safely –from A to B; entertaining us all the while. This is the Hyperloop Digital Innovation Challenge 2016 for a visionary high-speed tube transportation system. When the idea of the Hyperloop was first put forward by Elon Musk in August 2013, it seemed like science fiction. Certainly, the now-famous entrepreneur/investor made his fortune by betting big on human ingenuity and the future. From the internet payment provider PayPal, which he co-founded, to the ambitious goals of Tesla Motors, SolarCity and SpaceX, Musk’s name has become a byword for entrepreneurial disruption. However, being shot through a tube in a capsule from Los Angeles to San Francisco at a speed of 970 kmh (600 mph) seemed like a bit much to stomach even for tech-enthusiastic consumers and engineers, a far-fetched fantasy. Three years on, the project has moved forward surprisingly briskly. In March 2016, Hyperloop Transportation Technologies (HTT), the research company driving the enterprise, signed an agreement with the Slovak government to “explore building a local Hyperloop,” which would cut traveling time between Bratislava and Vienna from an hour to a mere 10 minutes. “First, the Slovak government asked us ‘Is this a real thing?’,” recalls Ben Cooke, Director of Media Relations. “They wanted to see concrete plans, feasibility studies.” HTT convinced them that the Hyperloop could be built in 36 months and be profitable in seven to eight years. Since then, HTT has taken root in the region. The Digital Innovation Challenge on July 6 in the Market Hall, a hackathon in all but name, was the first of a planned series of future events all across Europe. “We see it as an ‘innovation competition’,” explains Bibop Gresta, COO of HTT. “Our aim is to disrupt transportation as we know it.” Hyperloop wouldn’t merely be a transport vehicle, but part of an entire lifestyle ecosystem. 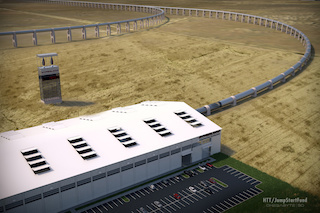 An artist‘s rendition of how a ­Hyperloop terminal may look. “We’ve got this idea of itinerary-based travel,” says Lloyd Marino, head of HTT’s Digital Experience Team and technology strategist. “While you are having a business meeting, your family can have a nice time sightseeing. And while you are traveling back, you can take care of your personal life. Crucially, every traveled mile, from your house to the station to the hotel or landmark, can be planned, booked and paid with one single app,” Marino said, laying out the vision of his team. This calls for radically new approaches. “We are not a traditional company, but a movement,” insists Ben Cooke, with enough messianic idealism to make any geek proud. It’s a business model based on crowd-sourcing labor and expertise. “Rather than pay six-figure salaries to the best engineers, we involve them and build the Hyperloop where we are welcome.” Most of HTT’s devoted engineers, technicians and managers signed on voluntarily and will get paid in shares of the company. More than 540 programmers from 52 countries are working together on the Hyperloop, with some 2,000 others standing by, ready to join. “This model allows us to harness people’s passion and attract talent from all around the globe,” enthuses Bibop Gresta. “And we’re talking here about high-caliber talent, from NASA, Space X, the world’s best laboratories,” he continues. The aim of events such as the Innovation Challenge in Bratislava is to foster local talent and bring them together with leading names in Silicon Valley, including Nolan Bushnell, the founder of Atari and digital visionary who sits on the HTT Advisory Board and brings more than a grain of American optimism to Central Europe. Grandees from HTT (Hyperloop Transportation Technologies) take to the stage in Bratislava to discuss the visionary ­Hyperloop project. To bring the vision one step closer, the young programmers in Bratislava were given a series of tasks revolving around simulated travel data from Germany and France. The winning team, ST Digital – two men and one woman working together for Slovak Telecom – tackled the “last mile problem.” In transportation, this refers to the difficulty of getting goods and people from a transportation hub to the final destination. The local link: ground transportation in real time – for those too lazy to walk up to the next bus station. 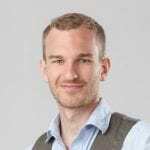 “We found the solution in about 20 minutes,” grins Martin Horvath, 33, “and produced an app that makes it faster and easier to plan and book trips. We were totally unaware that this was exactly what they were looking for.” Their prize? A one-week study trip to Silicon Valley. “It’s just awesome!” he gushes. Maybe American enthusiasm will put down deep roots in placid Central Europe after all.